Finally a product that will help you eliminate the need for paper towels and harmful chemicals, typically used while cleaning. 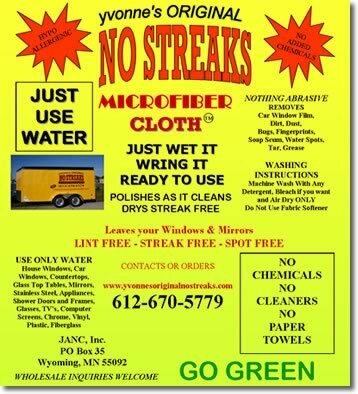 Using only water, “YVONNE’S ORIGINAL NO STREAKS MICROFIBER CLOTH” will clean your house windows, car windows, mirrors, glass top tables, countertops, appliances, shower doors and frames, chrome, stainless steel, fiberglass and any other surface that needs cleaning absolutely streak free, lint free, and spot free. All you have to do with YVONNE’S ORIGINAL NO STREAKS MICROFIBER CLOTH is wet it, wring it as dry as you can, and it is ready to use. It polishes as it cleans and dries streak free. There are no added chemicals. YVONNE’S ORIGINAL NO STREAKS MICROFIBER CLOTH is hypo allergenic. The best part is that when the cloth gets dirty, simply throw it in your washing machine with any detergent and bleach if you wish. Use no fabric softener, air dry, and use over and over. The more you use it, the better it works. Remember no paper towels and no cleaners. YVONNE’S ORIGINAL NO STREAKS MICROFIBER CLOTH can be purchased online or by phone or at one of our shows.Check the calendar for our show schedule. Remember, the more YVONNE’S ORIGINAL NO STREAKS MICROFIBER CLOTHs you buy, the more you save. 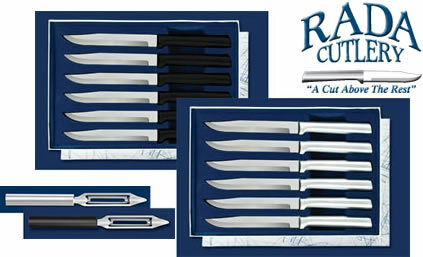 So stock up now. This is a simple way that you can GO GREEN and save money at the same time. Order your YVONNE’S ORIGINAL NO STREAKS MICROFIBER CLOTH today!